Aha! The humanities aren't usually predictive but I totally called this one. That's a hair's breadth away from the three births I predicted back in #40. The imageryon this stone is wonderful. The raised hands and swirling clouds imply that the deceased had a direct spiritual connection with God. The clothes appear to be a kaftan, a chunky necklace/choker, and (maybe) a headband. This is just a guess, but this attire may suggest a Holy Land/primitive Christian association. Judging from the image (even without the epitaph), I would guess that Sara Linkorn belonged to a Methodist or charismatic Christian church. Since she converted in 1764, Sara may not have been a Methodist (Methodism reached New England a few years later). 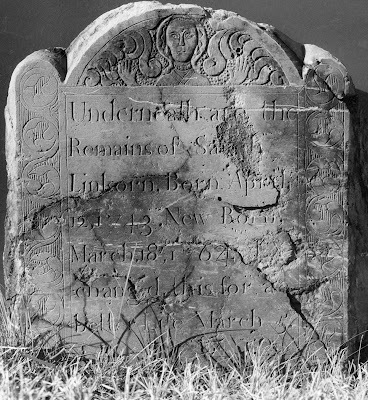 Does anyone know what other spiritual/charismatic/primitivist Christian sects were active on the MA/RI border in the 1760s? My Jesus & my all. Also of note — I've been looking for a "Linkorn" family in Attleboro, but have had no luck yet. There is, however, a large family named "Lincoln" . . . These are lovely examples. If you haven't picked a thesis project yet, this is just the sort of thing that might work. Benes' "Masks of Orthodoxy" tried to make a link between stonecarving and denominationalism, but I seem to recall thinking it was a bit of a stretch when I read it. But this case looks pretty clear cut. I see that the carver's name was New -- perhaps he was the official Methodist carver for the region. And where did he pick up the design? Is it an import, or a local innovation?